Wo rkers United represents 10,000 workers across Canada, and over 100,000 workers in the U.S. Our members speak over 50 languages, live in communities large and small, and work for international corporations and small local businesses – Workers United represents the diversity of North America’s workforce. Workers United members work in the garment and apparel industry; plastics, auto parts and industrial manufacturing; transportation and distribution; retail; food services; hotels and hospitality; cleaning services; and social services. Training opportunities and education workshops for local members. Legal defense to deal with unfair labour practices, illegal terminations, workplace discrimination and harassment, health and safety and human rights violations. Health and safety education and support with WSIB (workers’ compensation) claims. Union scholarships for members, their children, or grandchildren. Opportunities to become involved in union campaigns and movements to improve conditions for workers in Canada and around the world. 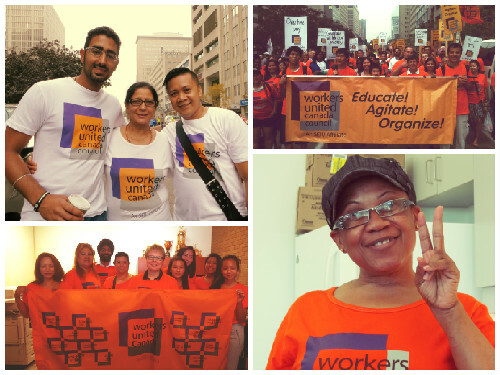 Learn more about Workers United by visiting our website!